This is the third, revised and expanded edition of the internationally prizewinning book Constructing Architecture by Andrea Deplazes. 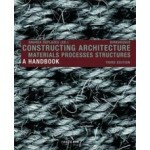 Since the first edition was published in 2005, it has been adopted as a textbook at many universities. With over 1200 illustrations, plans, and detail drawings, Constructing Architecture is a veritable encyclopedia for anyone interested in the essential technical information needed for building and construction, regardless of designstyle. This lavish but systematically organized book is divided into sections on materials, building components, building types, case studies, and a catalog of components, all drawn to a common scale, providing everything the professional or the student might need to transform their designs into built projects.Underlying this enormously practical book is a respect for the primacy of design, the belief that building is not simply a fact of engineering or technology, but the translation and culmination of a creative act that can only be successfully completed if the technical principles of construction are wellunderstood. Anyone seeking that knowledge will find it bursting from the pages of Constructing Architecture. Expanded to include new sections on courtyard house vs. patio house, shell construction - expansion - core and shell construction, entrance lift, and three new selected projects. Experience with the preceding edition has shown that the book has become an indispensable handbook for reference and reading not only for students and teachers but also for architects.